NEW HOME FOR THE BLUES AT THE CROSSROADS – Capital Blues Inc. 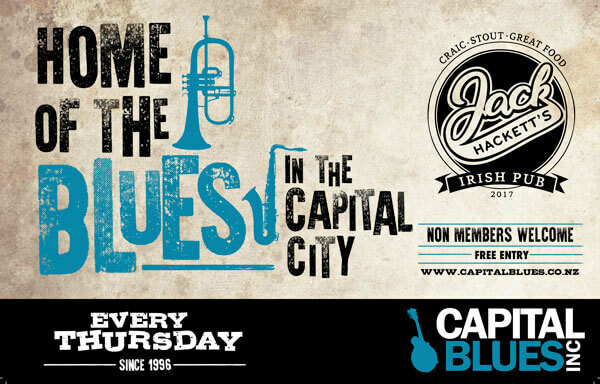 The Capital Blues Club has a new home at Jack Hackett’s. Formally ‘Bill Direen’s’ bar in the nineties, the stage at Jack Hackett’s hosted the very early gigs for the Blue’s Club back in 1996. After a long stint at The Bristol, the Club is fortuitously returning to its roots at the Crossroads of Dixon and Taranaki Streets. Blues artist Pip Payne was the driving force behind the Blues Club in the early years. He is returning to the very same stage 22 years later for the (re)opening night party with his band ‘The Gospel Project’ featuring Wayne Mason on keys. Julie adds “For over two decades, we’ve supported our local Blues artists with opportunities for their music and to develop our national Blues sound. New Zealanders really connect to the rich blues history, culture and sound. It is a vehicle for telling ballsy stories. Its roots are in struggle and slavery, and the dark emotional storylines of racism and poverty are still relevant today. And since the very beginning, it’s always been great music to appreciate with mates and a beer in hand”.